he Liberty head or "Mercury" dime was introduced in 1916, along with the new Standing Liberty quarter and the Walking Liberty half dollar. These bold new designs, together with the Buffalo nickel that introduced in 1913, made for a fresh-looking series of United States coins. 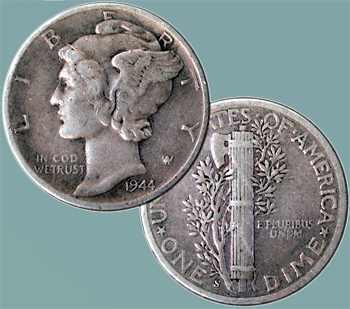 The dime's design was created by Adolph A. Weinman. The first issue included the key coin in the series, the 1916-D dime, with a low mintage of 264,000. Unlike some other low-mintage coins, this issue flowed readily into circulation, and thus most of the known 1916-D dimes in collections today are well-worn specimens. Most collectors who collected this series as recently as the 1950s found one or more 1916-D dimes in pocket change. The next few years produced an average of 50 million dimes from the three mints. In 1921, however, production was limited to Philadelphia (only 1.2 million minted) and Denver (1.98 million). In 1921 all three mints were busy making silver dollars, and not many of the other coins. Today the 1921 sells for well over $4,000 in mint condition, and the 1921-D sells for well over $5,000. Used specimens sell for $35 to $50, respectively. Most mintages in the 1920s were lower than previous issues, and they typically bring a premium  even in circulated condition. From 1934 to the end of the Mercury dime's production, mintages remained relatively high, with a peak of nearly 300 million in 1944. The interesting and scarce variety, 1942 over 41, was not discovered until several years later. It is worth more than $10,000 in mint condition. In the mid-1950s, a 1942-D over 41 was discovered, although the overstrike is not as evident as the 1942/41 (Philadelphia) variety. In mint condition it is valued at well over $5,000. The series ended in 1945. Early in 1946 the new Roosevelt dime made its appearance, due to the popularity of the late president, who died April 12, 1945, and his creation of the March of Dimes fund to aid victims of polio. Fortunately for collectors, quite a few uncirculated sets of Mercury dimes have been assembled, and while the prices have risen sharply in recent years, one can find a set for sale at auction now and then. I had owned two such complete sets in the early 1970s. However, due to the grading of some of the coins, many such sets have been broken down and sold singly. One set sold at auction in 2003 for more than $2 million. For many dates after 1940, uncirculated rolls can still be found at auction and on dealers' tables at coin shows. Dr. Sol Taylor of Sherman Oaks is president of the Society of Lincoln Cent Collectors and author of The Standard Guide to the Lincoln Cent. Click here for ordering information. ©2005, THE SIGNAL · ALL RIGHTS RESERVED.